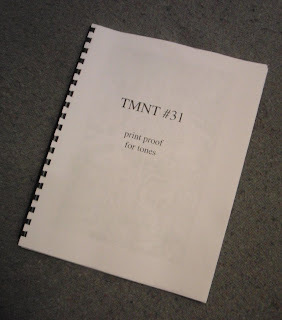 I have pretty much finished the tones for issue #31 of TMNT, and if all goes well in the lettering stage (which I hope to begin tonight or tomorrow), #31 might be sent to the printer within a few weeks. The photo above is of the cover page of a "proof print" I did so that I could see how the tones were going to look (sometimes things look different when they are printed than when you were looking at them on a computer monitor). I also wanted to get a look at one particular page on which I think I spent the most time doing tones of any page in all of Volume 4... and I'm not sure people will be able to tell. We'll see, I guess. So this means, I think, that if anyone wants to write a letter of comment for possible inclusion in issue #31, they should probably do it in the next couple of weeks. Well, THAT is some great news! Vol.4 is one of my favorite ongoing series at this time, and easily one of my favorite TMNT arcs ever. It's great to have two issues in such a short time, and I can't thank you enough for allowing yourself to take the time to do it right rather than rushing the schedule. Just wanted to let you know that many people love what you and Lawson are doing with vol.4; we're just not as vocal as some other folks. Excellent news. Keep it coming. I feel as though this can't be real. The next issue is already so close to reaching the final stages. Awesome! This is VERY great news, Peter. Us Vol 4 fans are clamouring for more, more, more and are excited about the renewed focus and attention toward the series. Thanks for keeping us posted! Great news. If you are so inspired to be working at this pace, you must really be enjoying yourself, which makes me happy. I very much enjoy Volume 4. Some of the first few issues were really good and then things got very strange (in a good way) and I hang onto each issue hoping to get another piece of that puzzle. I think it's coming together quite well. Where did you come up with that trippy time travel thing with April where she ends up as the roach? That had to be one of the most creative, creepy and downright thought provoking things I've ever read in a comic. I was legitimately creeped out and yet fascinated and intrigued at the same time. Didn't know if that was a borrowed plot device that I hadn't heard of or if it was just something from in your head, but I found it most interesting. I think this new found progress will help to kill allot of the negativity floating around in the fandom. I know it brings me allot of joy and I haven't said it yet but issue 30 was great. Keep up the great work and the great pace! Yes!! I am excited!! I love this book!! Now we're talking. It's tough to wait between issues when the story's so highly serialized. And I'd like to echo Newton's comments on Vol 4 #22. That is, without a doubt, one of the pinnacles of the entire Mirage Studios series. I'm not even a huge fan of April's origin, but the way that issue was done is fantastic. I concur with the sentiments about issue 22, by far one of the most well-written and interesting comics I've ever read and one of my hand's down favorites. I liked Issue #30. It seemed so out of character for the Mike we've come to know in various issues, but that's possibly a good thing....It felt like watching an episode of the new show, too, it went by so quick. I'm also interested in where this Karai Casey plot is going. Did she suddenly gain a crush on him, or just playing mind games? I was legitimately creeped out and yet fascinated and intrigued at the same time. Didn't know if that was a borrowed plot device that I hadn't heard of or if it was just something from in your head, but I found it most interesting." I think it was at least partly inspired by the Franz Kafka story "The Metamorphosis", in which -- so I've heard -- a character turns into a human-sized cockroach. I've never read the story, but have heard a lot about it and have seen many illustrations inspired by it. Beyond that, I needed a way to tell the true story of April's "birth" in such a way that April would see it herself as it happened, so that -- as incredible as it might seem -- she could not deny the evidence. Of course, we have this convenient "Timestress", Renet, who has been known to move people back and forth among time periods. I thought that it would be cool if she agreed to help April, but only in a way which didn't change that past which April was going to see... hence the two of them observing as relatively inconsequential house pests. I'm also interested in where this Karai Casey plot is going. Did she suddenly gain a crush on him, or just playing mind games?"